Sorry, this item is currently unavailable. Please consider purchasing Numark 100% Pure Eucalyptus Oil 25ml instead. Price: £1.75 (incl VAT) Sorry, this item is currently unavailable. Please consider purchasing Numark 100% Pure Eucalyptus Oil 25ml instead. 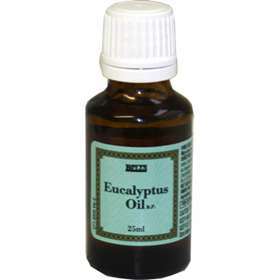 Bell's Eucalyptus Oil 25ml is a natural cooling and easing oil with a wide range of uses. It may also be used as an inhalant. Can be used as an inhalant. Sprinkle a few drops onto a handkercheif and inhale the vapour as required or place a few drops in hot (not boiling) water and inhale the vapours for 5-10 minutes. Product code: 1070945 Price: £1.75 (incl VAT) Sorry, this item is currently unavailable. Please consider purchasing Numark 100% Pure Eucalyptus Oil 25ml instead.